Deep Tissue, Soft Tissue Therapy, Sports Massage, Swedish, Trigger Point Release, and more! Paso Robles Massage Therapy has affordable pricing to fit your budget. Very reasonable prices. Contact us to set your appointment today. We are flexible to ensure your massage works with your schedule. We have experience in both clinical and spa massage settings. We offer Couples Massage, Deep Tissue Massage, Soft Tissue Therapy, Sports Massage, Swedish, Trigger Point Release, Neck and Back Pain Management. Massage can be defined as structured, professional touch. Massage techniques manually manipulate the muscles, tendons, and fascia of the body to promote health and wellness. Benefits of massage include stress reduction, circulation enhancement, increased relaxation, and relief from muscular tension, soreness, and pain. At Paso Robles Massage Therapy, couples who practice a healthy lifestyle can enjoy the benefits of a wholesome, rejuvenating massage together thus saving time and bonding with each other. Both clients receive unique treatment to address their specific needs. One can receive a Deep Tissue, sports massage while the other can relax thus accomplishing two goals at the same time. Although a couple’s massage can be romantic, it can also be an ideal time for family members to enjoy time together. Whether it a “girl’s night out” for friends or mother-daughter time, you’ll be able to let your stress slip away while enjoying your time together. 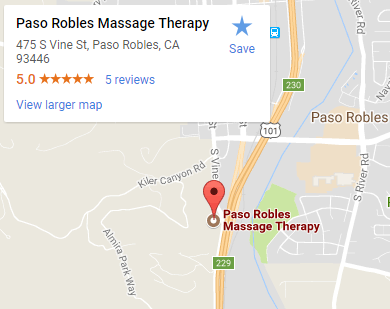 Paso Robles Massage Therapy is located just outside beautiful Downtown Paso Robles. In 2013 we opened our doors and have continued to offer quality traditional therapeutic massage services to the community since. Paso Robles Massage Therapy is focused on the client’s well being throughout each session. We specialize in techniques for relieving muscle pain and tension while providing a clean, safe, positive and relaxing experience. Our therapists offer massage therapy services in a variety of modalities at the Paso Robles location. We strive to help clients achieve their health and wellness goals by providing exceptional service in each session. Our therapist are certified by California Massage Therapy Council (CAMTC) which requires members to complete a minimum of 500 hours of specialized massage therapy training prior to receiving certification through their organization. Paso Robles Massage Therapy offers their credentialed massage therapy services to visitors and residents throughout San Luis Obispo County including Paso Robles, Atascadero, Templeton, San Miguel and Creston. A parking lot is available. Payments methods accepted are: cash, local check, Visa, Mastercard and American Express. Contact Paso Robles Massage Therapy to schedule an appointment today. Appointments are offered daily from 8 a.m. to 9 p.m. Contact Paso Robles Massage Therapy to schedule an appointment today. Paso Robles Massage Therapy services are offered daily from 8 a.m. to 9 p.m.